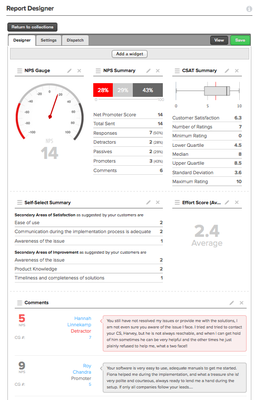 New self-managed system adds multiple question types and scales to well established Net Promoter questionnaire from CustomerGauge, together with enhanced reporting components to allow enterprises to easily construct dashboards. CustomerGauge raises the bar on collecting and sharing customer insights with its new Survey Builder and Report Designer features. New survey widgets including Customer Effort Score have been added to its extensive range of questions. 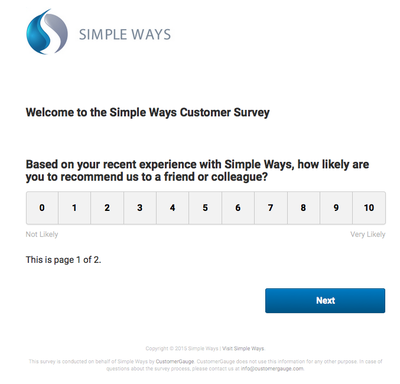 Now customer experience professionals can quickly build a questionnaire with “Twenty Questions” for maximum customer understanding, or a Net Promoter® style “Just One Question” survey to maximize response. In response to client requests, the company has been extending the range of questions. It is now easy to create, customize or add additional questions to the Net Promoter survey on CustomerGauge’s self-managed Survey Builder. Additional text questions, drop down list questions, Customer Satisfaction and Customer Effort Score questions can also be included in a survey. Additional rating questions have the possibility of being a 0 – 10 scale or a 1 – 5 scale. Clients can construct surveys from 1 to 50-pages in length. CustomerGauge also refreshed their “classic survey” which contains just two or three questions – the length recommended by Net Promoter innovator Fred Reichheld. These slim surveys help companies understand customer loyalty and regularly get survey responses of 60% or more. The new survey template is designed to work seamlessly on any device – smart phone, tablet or desktop to maximize response. It can be completely tailored to include company logo and corporate design. To display the results, the new CustomerGauge Report Designer feature allows customizable reporting, created easily by a user from within the platform. Pie charts, bar graphs, NPS gauges, table summaries and comment reports are all readily available. Understanding your customers has never been more easy and flexible with CustomerGauge’s new self-managed survey feature and template design.